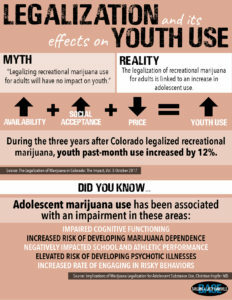 Legalization and its Effects on Adolescent Use | Building A Safer Evansville, Inc.
Legalizing recreational marijuana use for adults will have no impact on youth. The legalization of recreational marijuana for adults is linked to an increase in adolescent use. Many believe the common misconception that legalizing recreational marijuana use for adults will have no impact on our youth. However, studies have shown that the legalization of recreational marijuana for adult use is linked to an increase in adolescent use due to increased availability, greater social acceptance, and possibly lower prices. Youth past month marijuana use increased 12 percent in the three-year average (2013-2015) since Colorado legalized recreational marijuana compared to the three-year average prior to legalization (2010-2012). Adolescent marijuana use has been associated with an impairment in a number of areas including impaired cognitive functioning, increased risk of developing marijuana dependence, elevated risk of developing psychotic illnesses, and increased rates of engaging in risky behaviors. This reality becomes all too real with the possibility of marijuana becoming more accessible to our youth.